The journalist’s art is now one of the computer keyboard and the internet connection, but there was a time when it involved sleepless nights over a manual typewriter followed by time spent reviewing paper proofs freshly inked from hot lead type. Newspapers in the golden age of print media once had entire floors of machinery turning text into custom metal type on the fly, mechanical masterpieces in the medium of hot lead of which Linotype were the most famous manufacturer. Computerised desktop publishing might have banished the Linotype from the newsroom in the 1970s or 1980s, but a few have survived. One of the last working Linotypes in Europe can be found in a small print workshop in Vienna, and since its owner is about to retire there is a move to save it for posterity through a crowdfunding campaign. This will not simply place it in a museum as a dusty exhibit similar to the decommissioned Monotype your scribe once walked past every day in the foyer of the publishing company she then worked for, instead it will ensure that the machine continues to be used on a daily basis producing those hot metal slugs of type. Fronting the project is [Florian Kaps], whose pedigree in the world of resurrecting analogue technologies was established by his role in saving the Polaroid film plant in Enschede, Netherlands. There are a variety of rewards featuring Linotype print, and at the time of writing the project is 46% funded with about four weeks remaining. If you are curious about the Linotype machine and its operation, we’ve previously brought you an account of the last day of hot metal printing at the New York Times. It’s no secret that a great deal of Western civilization was informed by the ancient Greeks. They revolutionized mathematics and geometry, developing astronomy along the way. They built ornate statues, beautiful temples to the gods, and amphitheaters for live entertainment with astonishing acoustics. The influence of the ancient Greeks shaped almost every field of human knowledge, from the arts and architecture to politics, philosophy, science, and technology. Like the Babylonians, the Greeks paid close attention to the night sky. Our nearest celestial neighbor, the Moon, was particularly important to them from a planning perspective. For instance, debts might be due on the new Moon. By heeding the Moon’s phases and taking note of eclipse cycles, they found that their harvests were more fruitful, and they had fewer incidents at sea. As savvy and well-rounded as ancient Hellenistic culture appears to have been, it’s not unreasonable to imagine that the Greeks could have created some kind of computing machine to make their Moon-centered scheduling easier. Based on fragments from in a shipwreck that was discovered in 1900, it seems they did exactly this. Based on scientific dating of the coins and pottery found in the wreck and inscriptions on the bronze remnants, historians and scientists believe the Greeks created a mechanical computer capable of calculating the positions of the Sun and the Moon on any given day. This marvelous device is known as the Antikythera mechanism. The mechanism was housed in a wooden box and controlled with a knob on one side. It is believed that the front of the box was a display made up of a set of concentric rings with graduations, and that each ring corresponded with one celestial body. Pointers attached perpendicularly to output gears moved around the rings as the knob was turned, showing the paths and positions of these celestial bodies over time. This Earth-centric planetarium also displayed the phase of the Moon as well as the positions of the five major planets known to the ancient Greeks—Mercury, Venus, Mars, Jupiter, and Saturn. Now is your chance to hold a piece of Hackaday in your hands. Last year we announced our first ever print edition. We continue that tradition with a much bigger offering. 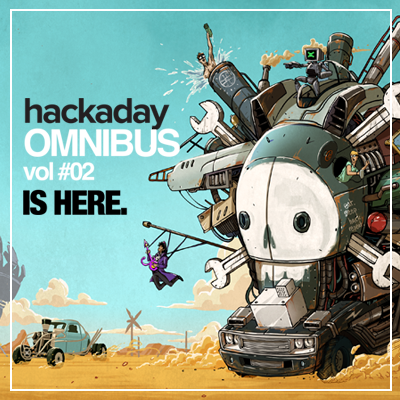 Hackaday Omnibus vol #02 gathers the best content from Hackaday over the last year. This includes in-depth original content, incredible art, the events that mattered over the last 12 months, and a few cryptic easter eggs. [Joe Kim], Hackaday’s Art Direct, really outdid himself with the cover this year. Inspired by an epic movie, the illustration includes a shoutout to almost every article found within. Of course there is a lot more of his work inside, along with the efforts of dozens of writers, artists, editors, and more. All 128 pages of Omnibus vol #02 were painstakingly laid out by [Aleksandar Bradic] who enlisted the help of a dedicated core of Hackaday.io members to help pore over the final drafts, ensuring the presentation is immaculate. Along the way some of them teamed up to roll in those easter eggs that I previously mentioned. We don’t even know what all of it means, you should be the first to solve the mystery. Most of the 31 articles that grace these pages have run past the front page of Hackaday. But there are a few that were written specifically for the print edition. These will be published on our front page starting in 90 minutes and continuing for a few weeks. It is important to us to share these great works without the need to purchase anything. 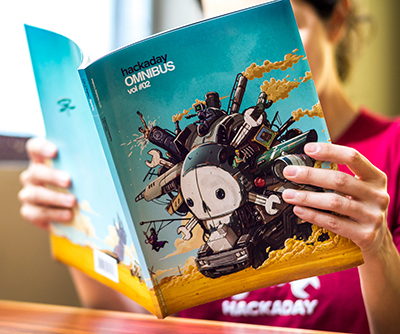 But the Omnibus is truly one of the coolest pieces of tech literature that you can own. It deserves a place on your coffee table, reception area at work, and as a gift for all who love to know how things work, how things were built, and the legacy of knowledge that has come from generations of hacking. We’re only running a single printing of this gorgeous volume. Make sure you get one of your own by placing a pre-order now. Be one of the first 500 using coupon code OMNIBUS2015 and get it for just $10! Show that you support great content and help make future projects like this possible.